Very reasonable prices same as last year. 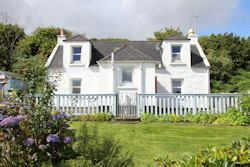 ​​​Taigh Mairi was my home for some time therefore our aim is to make your holiday on Skye as enjoyable and comfortable as possible and we would like to think that Taigh Mairi will be like a home from home for you too. We don’t want to leave this lovely cozy cottage which always feels very welcoming. I think we have found the cottage we want to return to Forever.